Remember that the Friday night meeting will take place on location, not at tRg studios. We will meet at 7 pm and shoot at Curtis Hixon Park in downtown Tampa. 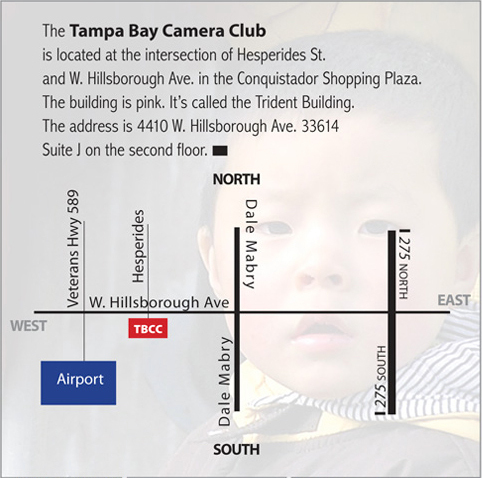 The address of the park is 600 N. Ashley Dr. Tampa, FL 33602. Street parking north of Kennedy Blvd. is free after 6 pm. If you park on the street and are unsure about the enforcement hours go to the nearest parking payment kiosk and enter your parking space number. The kiosk will inform you of the hours of enforcement for your space. It is recommended that you bring a tripod if you have one. There are two new listings on our Photo Opportunities page with information regarding photo safaris in Uganda as well as closer to home in Manatee County. I’m looking forward to the workshop tonight. Just a few reminders for anyone who plans on attending: don’t forget to bring a tripod and if you need directions or have trouble finding the location give me a ring at 813-641-4470. On the afternoon of February 12th, after the video series presentation at TRG studios, several club members plan on heading over to the state fair. Anyone who is interested is welcome to go. No formal arrangements have been made, simply get together with anyone else who is going after the video presentation. This information is also cross-posted on our Photo Opportunities page. Are you interested in using your photographic skills to give back to the community this holiday season? If so, then considering volunteering for Help Portrait Day. The concept is simple: On or around December 4th take portraits of anyone you feel could use your service but may not be able to afford it. Edit, print ,and deliver the work. That’s it. You can volunteer to be part of a group that’s taking part or simply do it on your own for someone you know in need. It’s not a contest, there is no need to display your work anywhere. Just put your skills to use to help someone out. I am volunteering to work with a group that is helping people in a rehab program. I know other groups that are looking for help with taking photos, editing photos, or printing photos. I can put you in touch with others who are taking part or you can find out all the info for yourself by following the link on our TBCC Photo Opportunities page.